One of the BEST things about summer’s juicy, ripe tomatoes fresh from the garden or farmers’ markets, is that you can enjoy Classic Bruschetta with Tomatoes, Basil and Garlic like no other time of the year! 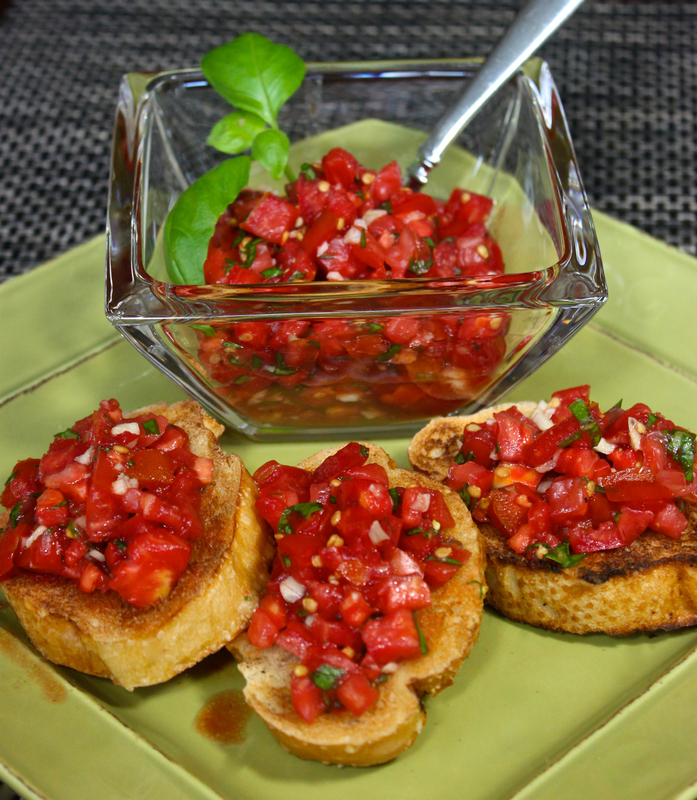 This traditional Italian appetizer recipe is THE BEST bruschetta in the world! The essence of all those fresh garden flavors is captured perfectly in this super-easy recipe. First of all, something needs to be set straight about HOW to say the word ‘bruschetta’. When you first look at the word you might think it sounds like a brush with ‘shetta’ added on. NOPE, wrong . . . you don’t pronounce the ‘ch’ sound as you do in the word ‘shoot’. In Italian, the ‘ch’ letters are pronounced like a ‘K’ such as in the word ‘kind’. And the ‘u’ is pronounced ‘oo’ in Italian too. So repeat after me three times, ‘broosKETTa’, ‘broosKETTa’, ‘broosKETTa’. Also the accent is on the ‘KETT’ part of the word. You also want to hold your tongue down longer when you say the two “t’s”. There, that’s a little Italian lingo lesson for the day. Learn something new everyday, huh? Now if you can’t get tomatoes from a garden or farmers’ market, you can order the best tasting, no-substitutes, imported tomatoes from Italy: Link to order –> Imported San Marzano Tomatoes from Italy and they are canned already with the peels off for you! There is a large variety of brands to choose from and they aren’t very expensive at all! Oh did I tell you that this bruschetta is perfect? Prepare this at least an hour ahead of time so that all of the delicious flavors marry and blend nicely. Serve bruschetta already topped on small slices of toasted bread OR set it out in a pretty serving bowl alongside toasted bread slices which allows guests to top their own bread slices (the latter way also prevents the toast from getting soggy as they sit on a tray from the juice of the tomatoes). Then sit back and watch this classic bruschetta devoured by your guests! 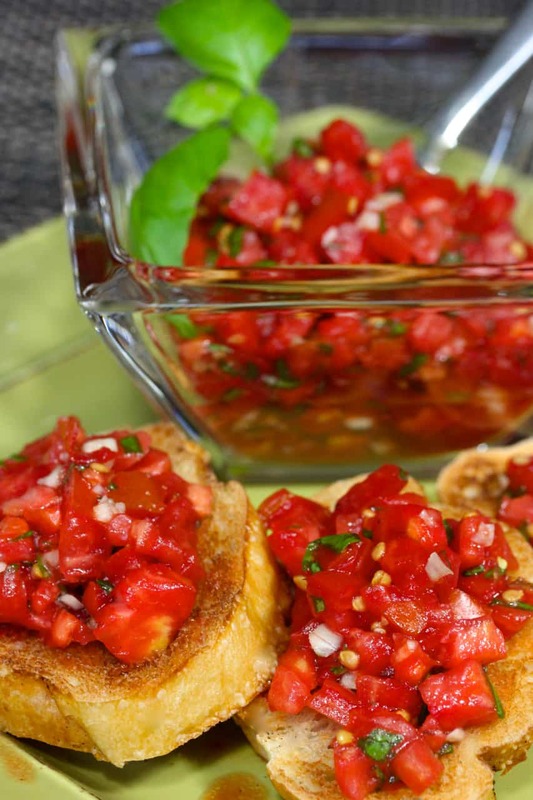 EEnjoy this Classic Bruschetta with Tomatoes, Basil and Garlic ! We’re happy to share this time-tested, family recipe with ‘amore’ from our cucina and acreage to you. Do you enjoy La Bella Vita Cucina? We’d love to have you as part of our little community! Click here: La Bella Vita Cucina to get new recipes, travel tips and gardening ideas straight into your inbox! I had tomato bruschetta (using German rye bread) for the lunch too! Gotta make some more with Italian bread tomorrow. Yum! I’m making another batch of bruschetta today and sure wish I could serve you some for lunch Angie! I love bruschetta too. I wish I had some now. Thanks Annamaria, it’s such a classic Italian recipe! I’ll be right by to see what you’ve been cooking on your blog! Consequently delectable! That appears impressive! What a perfect description for this fresh bruschetta Claudia! Thanks so much! You’re so right – this is a classic, but what a classic it is! So lovely! Hi MJ! You can’t go wrong with great classics, prepared simply and without anything added to keep it simple and perfect! This is one of my very favorite things to make (and eat), Roz! It is one of the reasons I look so forward to having a garden. This bruschetta recipe sounds perfect. I like a lot of basil and garlic, too. I’m glad you taught us how to say the word bruschetta. I have been saying it wrong all these years! :( Your sister-in-law’s company sounds very interesting. I love all the things you described about it. Thanks so much for sharing her recipe with us. You’re welcome Shari! When the time comes, I can’t wait to hear about your garden bounty! It’s finally cooling off a bit here to feel like fall and I hope that you’re enjoying this beautiful time of year in the Valley of the Sun! I hope to return someday to visit family and to meet YOU! You visited my site on Sunday, and I wanted to come by to say thank you. I’m glad you liked my post about content curation. In response to your post, it looks wonderful. I love all the recipes I see here. Nice to meet you. Thanks again. Have an estimate as to how many cherry tomatoes would equal a pound? Garden fresh so no label to tell me. Thanks! SJ — I would say that NO LESS than 30 cherry tomatoes equals a pound . . . . but simply use a kitchen scale to easily determine a pound of ‘cherry tomatoes’, because they are all a different size and weight. Please let me know what you think, SJ! Buon Appetite, good friend! Hi Janice! Welcome to my blog! I’m glad that I found yours and am anxious to learn more from you. Yes, I do get traffic from Instagram; it’s become a very good avenue for me for like minded people. I’d be happy to help you out! Fantastic Teresa!!!! Let me know if you ever want me to share your bruschetta photo on the blog post! So i doubled the tomatoes to two lbs. Of course i doubled the garlic and fresh basil!! Any suggestions for doubling the tomatoes for the recipe?? 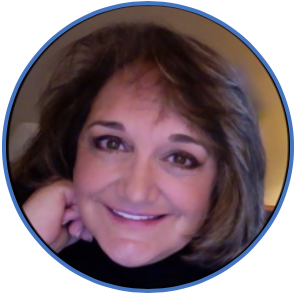 I love this one – im signing up for the newsletter! This is really a yummy bruschetta recipe! Glad that you are using a good aged balsamic from Italy too! Way to go! For doubling the tomatoes, just use twice as many tomatoes. Whatever is left over can be used on the balsamic bruschetta chicken recipe on the blog that is superior and healthy too! Let me know how things go. I also am very happy to share photos (anonymously shared) if you like on the same blog post of the recipe, if you like. So excited to make this recipe. It sounds so healthy and was thinking to have them in the morning for breakfast or as a snack. Do you know how many days I can keep this batch in the fridge? It would be quicker, just have to make the toasts fresh. Thanks again for this wonderful recipe. What a great question! I would not go over 2 days in the refrigerator because the tomatoes begin to break down in the vinegar and get pretty mushy.